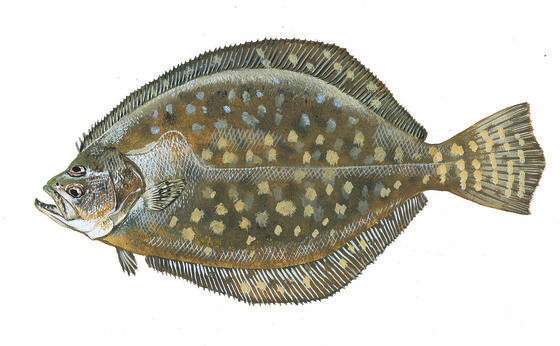 Southern flounder typically weigh 1-2 pounds, with females generally growing larger and living longer than males. On July 1, 2017, legislation recently passed by the South Carolina General Assembly will increase the size limit and lower the bag and boat limits for southern, summer, and Gulf flounder in state waters. Flounder rank among South Carolina’s top three most popular fish for recreational anglers, and South Carolina Department of Natural Resources (SCDNR) research has shown declines in their numbers over the past two decades. The new measures are intended to help rebuild flounder populations by giving more fish a chance to reproduce before they reach a harvestable size. The regulations taking effect July 1 will change the minimum legal size for flounder from 14 inches (total length) to 15 inches (total length). Additionally, changes to the bag limit will reduce the number of fish an individual can keep from 15 flounder per day to 10 flounder per day, with a maximum boat limit of 20 flounder per day. The changes passed in the 2017 legislative season mark the first adjustments to flounder regulations since 2007. “The new size and bag limits should be effective in increasing the number of spawning flounder, and hopefully that should result in a recovery of the flounder population,” Whitaker said. SCDNR biologists study flounder in a number of ways. The fish are frequently caught and released on SCDNR trammel net surveys, which have been used to study the fish in South Carolina estuaries since 1990. Trammel net data have shown a decline in flounder numbers since the late 1990s. Flounder are also seen in the trawl surveys conducted just off the coast by the Southeast Area Monitoring & Assessment Program. Recreational landings of flounder have also declined in recent years, even as the number of registered saltwater anglers has grown in South Carolina. Its about time. SC drags there feet WAY to much. They should have done this 10 years ago. Saw this earlier today. I have one question. I don't know much about this other that hearing people talk about it and reading. How do these size limits work for those who gig flounder. You can't measured till you gig them then the fish is dead. Just wondering. IMO, the method of taking the fish irrelevant, it is of legal size or it is illegal. I would err on the side of caution when gigging or bowfishing. If you want to lock horns with a warden or a judge you'll probably come out on the losing end. The same way you judge a buck on a trophy managed club. If you are struggling to determine if a buck is big enough to shoot, then don't shoot him. The same can be said about the flounder. Once you are good at it, you can determine very quickly whether the fish is big enough or not. Even the best make a mistake every now and then. The good part is a flounder that is 1/4" short will usually live just fine with a couple of gig holes in it as long as it is not in the head to bad. Stuck many, many with scars. Deer are usually not so lucky with modern day rifles though, and there is a club fine, in most cases, for shooting a deer with antlers that are too small. Too many strikes, and you are out.